It is a continuing annoyance to me that audio books with an Australian voice – either author or narrator – are difficult to come by even though the format has exploded in recent years. So I usually snap them up when I see them which is how I came to squeeze another read into this year’s AWW Challenge. Former journalist Jaye Ford is carving out a niche for herself as a teller of stories in which frightening but entirely believable things happen to people just like the reader. Not so long ago this ‘average person in peril’ trope was the domain of men, normally doing absurdly unrealistic things to get themselves out of various jams. In Ford’s books though the person at the centre of events is generally a woman. Often, as in real life, at most danger from a bloke. In DARKEST PLACE we meet Carly Townsend. She has just moved to Newcastle from the small outback town she grew up in. She’d left once before but that didn’t last long when tragedy struck. Thirteen years later she has an apartment in a renovated industrial building and has enough savings to be a full-time student, at least for a few months. But when Carly’s home is broken into on only her third night in residence her new life starts to look more troubled than she’d hoped for. That’s all I’ll say about the plot because half the pleasure of these kinds of books is experiencing all the twists and turns for yourself. Ford does a great job of teasing the reader. Introducing people who might (or might not) be dangerous, sharing a reflection from Carly’s past that may (or may not) be relevant to what’s going on in her present-day life. Or is Carly herself the untrustworthy element in this story? Perhaps the only drama is in her own imagination? The reader is never sure who or what to believe here which builds a delicious kind of tension. Well delicious for me, experiencing it from the safety and comfort of my reading nook; not so delicious for poor Carly who is living in mounting trepidation and anxiety. There’s a strong cast of characters in DARKEST PLACE too. Carly herself is well developed; struggling to come to terms with her past in a believable way and yet despite having a lot to deal with she doesn’t wallow in self-pity. Or not for long anyway. She meets an interesting array of new people as neighbours and fellow students though they are all potential suspects. Or perhaps I was alone in trying to work out how the girl with the broken ankle might be hiding her true identity as a twisted stalker. There is even a romantic interest (but again he might be the one terrorising Carly). And let’s not forget the building into which Carly has moved. Ford gives it a palpable presence in the story which makes for a very effective, almost claustrophobic setting. Fans of the audiobook format should enjoy Sarah Blackstone’s narration as much as I did; she really brings Carly’s story to life and it is nice to hear Australian voices telling Australian stories. Which makes this the complete package. A truly scary tale of psychological suspense with credible characters and a cracker of an ending. This is book 21.5 that I’ve read and reviewed for the fifth Australian Women Writers Challenge (one book was written by a father daughter team so I’m only counting it as a half). For more information about the challenge check out my challenge progress, sign up yourself or browse the Challenge’s database of reviews. An adrenaline-pumping suspense novel from the author of BEYOND FEAR. What if a stranger is watching you sleep – and no one believes you? Carly Townsend is starting over after a decade of tragedy and pain. In a new town and a new apartment she’s determined to leave the memories and failures of her past behind. However that dream is shattered in the dead of night when she is woken by the shadow of a man next to her bed, silently watching her. And it happens week after week.Yet there is no way an intruder could have entered the apartment. It’s on the fourth floor, the doors are locked and there is no evidence that anyone has been inside. With the police doubting her story, and her psychologist suggesting it’s all just a dream, Carly is on her own. And being alone isn’t so appealing when you’re scared to go to sleep . 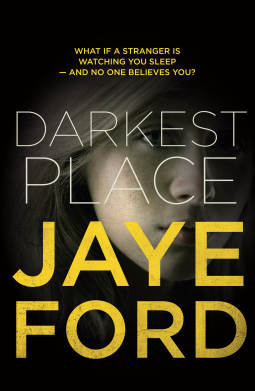 Australian author Jaye Ford certainly knows how to write a good thriller. Carly Townsend moves across the country to Newcastle, NSW, to start a new life. For the last decade she has been living with the fact that she killed her three best friends. Her new apartment is on the 4th floor of a renovated warehouse. All modern. But the first thing she learns is that there is a sad story about the girl who used to own her apartment. Carly herself is pretty fragile, the result of two failed marriages, three miscarriages, and the death of her three friends. She thinks she has lost the outgoing personailty she once had, and wonders if she can find it again. She begins a business course at a local TAFE and is lucky to be befriended by twenty year old with big ideas. Carly hasn’t slept well for years but then she is woken in the early morning by a hooded man. She reports the home invasion to the police but by the third time they have had enough of her wasting their time. Jaye Ford ceratinly knows which of our “fear” buttons to press. terrified has found her again … and the man she loves. This is the third novel written by Jaye Ford that I’ve read and I have enjoyed them all. Each has taken a realistic scenario, if a little embroidered to hype up the tension, and put them in an Australian setting that I can relate to. The structure remains interesting as Rennie puts together the circumstances of Max’s disappearance and then fits them into various scenarios, discarding them one by one. The ultimate solution is the one she really doesn’t want to believe. The story is layered. The further we read the more layers are peeled back and we learn of both Rennie’s and Max’s back stories. Throw in too Max’s fourteen year old son who has run away from his mother who has gone for a holiday to Cairns. Hayden decides not to go with her and turns up just after his father has disappeared. He and Rennie have to work hard to get on. When Livia Prescott fights off a terrifying assault in a deserted car park, the media hail her bravery. And after a difficult year – watching her father fade away, her business struggle and her marriage fall apart – it feels good to strike back for once. But as the police widen their search for her attacker, menacing notes start arriving. And brave is not what she feels any longer . . . Someone has decided to rip her life apart, then kick her when she’s down. But is it a stranger or someone much closer to home? In fact, is there anyone she can now trust? When her family and friends are drawn into the stalker’s focus – with horrifying consequences – the choice becomes simple. Fight back, or lose the people she loves the most . . . It is unusual for me to read two novels by the same author back to back but I only finished Jaye Ford’s first novel BEYOND FEAR last week. There are similarities between the two novels: both describe a woman’s reaction to intimidation and fear. Both develop suspenseful scenarios, and I think Ford does this very well, even though I found each book a little long. Both kept me up reading well into the night. It seems at first that the assault on Livia Prescott is a random mugging, but Liv soon comes to the realisation that she is being targetted and that her friends and family are also in danger, but what is it that her stalker wants? With her, the reader tries to work out who is attacking Livia, who among those around her can be trusted. 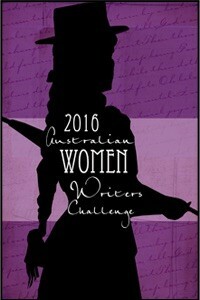 Jaye Ford talks about writing SCARED YET? 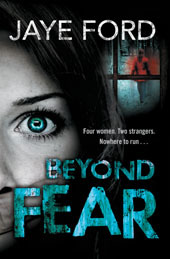 Winner of 2012 Davitt Award (Debut Novel) and the 2012 Davitt Award (Readers Choice) for BEYOND FEAR. 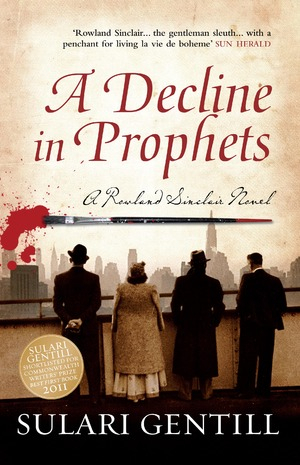 Winner of 2012 Davitt Award (Debut Novel) and the 2012 Davitt Award (Readers Choice). However, unknown to the four women, their secluded cabin was once the focus of a police investigation and, like Jodie, it nurtures a dark secret. As her friends relax, the isolation reawakens Jodie’s terrifying memories. When she finds evidence of trespassers, she is convinced they are being watched. The setting is rural New South Wales, an isolated barn, newly renovated as a country weekender, and far enough out of town to reinforce the feeling of isolation. Out of mobile phone connectivity range too, always enough to make holiday makers worried. The weekend does not start well when Jodie’s car is forced off the road near their destination and things begin to go down hill from there. I felt the book was just a little too long, particularly with the violent scenes towards the end, but then I guess we had to find out why these two men had turned at the barn. By the last 50 pages much of the mystery had been solved and so the author was left with the problem of how many of the main characters could be extricated safely. That said, if I could write half as well as Jaye Ford I’d be happy. It did keep me reading far into the night. Jodie, Hannah, Louise and Corinne plan a relaxing weekend away without their kids or husbands. It is Jodie’s turn to select the venue for the friends’ annual getaway and she’s chosen a newly renovated barn in the country town of Bald Hill, a short drive from Newcastle where the women all live. The weekend starts to go wrong when the women have a minor car accident on their drive to the barn, though this does provide the opportunity for them to meet Matt Wiseman, working at his father’s garage while recovering from injuries received in his job as a policeman. Though they do manage to squeeze in some some of the champagne-drinking and chocolate-eating they planned, the weekend turns very grim for the four friends when two men turn up at the barn and won’t leave. A debut novel by a former journalist, Beyond Fear is a fast-paced psychological thriller and an easy read that I gobbled up in a single sitting. As a reader you know from the outset that something’s going to go wrong with the idyllic weekend but the author manages to build suspense by not taking the obvious route to peril and the lead up to the story’s turning point is very well done. The fact that two of the characters, Jodie and Matt, have secrets from their past that are likely to impact their behaviour in the dangerous circumstances which unfold here just adds to the tension because it is believable that they might do things the average person would not do. For me though the climax of the tension came a bit too early and though the author tried hard to maintain the suspense for the remaining half of the book it did become a little repetitive with long fight sequences and each woman taking her turn to have a mini meltdown before pulling herself together for the sake of her friends. For the most part the characters were well-depicted and largely credible though I did want to shake both Matt and Jodie for constantly blaming themselves for what was happening. However the people generally behaved as people might in such circumstances and I thought Ford did a good job of depicting the villains of the piece, particularly towards the end where we got some real insight into the pair and what drove them (though we never got a sensible explanation for why they chose to enter the barn when they knew it was full of people given they’d had the same access to the site while it was empty but I suppose I can go with the flow on that one). There is a lot to like about this thriller including its strong female characters and snappy pace. There’s also a nice hint of romance which, because it’s only a hint, I rather enjoyed. I did think the first half was stronger than the second in terms of suspense but overall it’s a solidly entertaining read. Here at Fair Dinkum we have a broad definition of crime fiction so include thrillers and psychological suspense which allows us to highlight another debut from an Australian author. Imagine if your worst fears came true . . . again. At seventeen, Jodie Cramer survived a terrifying assault at the hands of three strangers. Her schoolmate Angie was not so lucky . . .
Now thirty-five, Jodie is a teacher and mother of two – and her past is a horror she’s buried deep. When she sets out for a weekend in the country with three friends, all she has in mind are a few laughs and a break from routine. However, unknown to the four women, their secluded cabin was once the focus of a police investigation and, like Jodie, holds a very dark secret . . . When Jodie finds evidence of prowlers at the cabin, she is convinced they are being watched, though none of her friends believe her. And after suffering flashbacks to the night of Angie’s murder, she also starts to doubt her own sanity. Until two men come knocking at their door. You can find out more about Jaye at her website. The book is officially released in Australia on March 1 and will be available in trade paperback and ePub formats (which is a good sign that things are changing here as it’s still quite rare for Australian titles to be released in digital format at the same time as they are released in print).